Since 1985, Cutting Dynamics has engineered and manufactured complex assemblies for clients in a variety of industries. 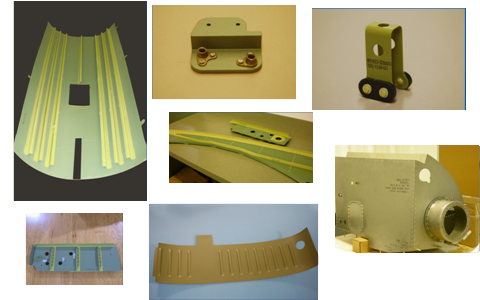 We specialize in hydroformed aluminum and hot-formed Titanium components, assemblies, and kitting for the aircraft industry. And as our technological capabilities grow – we have one of the world’s most advanced systems for processing continuous & chopped fiber thermoplastic composites – we are able to better service our strategic partners. Assembly/kitting – We have an experienced structural aircraft assembly team, and our barcoding and electronic record-keeping system makes our kitting department as efficient as possible in managing inventory for large-scale aircraft component kits. From large to small applications, Cutting Dynamics can fulfill all of your complex assembly needs.And by working with a variety of materials – including aircraft-grade aluminum, #4130 steel, stainless steel, titanium and thermoplastic carbon fiber – we can truly adapt ourselves to any type of client. No matter the application, we look forward to engineering the complex components and assemblies your company needs. To learn more, be sure to contact Cutting Dynamics today. The Mission of Cutting Dynamics, Inc. is to provide unmatched value to customers in need of high-quality components, assemblies, engineering solutions, or kitting needs within the aerospace industry. We accomplish this through an established system of measurable objectives, industry-leading technology, and continual improvement.